After two Lego Star Wars games covering a movie trilogy each, can Star Wars: The Force Awakens carry an entire Lego game by itself? Not without a lot of help. For example, I launched the game halfway through downloading to my PlayStation 4. While most of the game was waiting for more data, I was able to play through the 30 minute Prologue mission. Lego Star Wars: The Force Awakens begins with the climax of Return of the Jedi. The battle above the second Death Star, Ewoks versus Stormtroopers, Luke and his father bonding over murdering dad’s boss—the whole shebang. Why? Because it helps establish the events leading up to The Force Awakens, giving those new to the franchise some context from which to . . . I’m just kidding. It’s padding. There is absolutely no other reason for this level to exist. Was it nice to visit the forest moon of Endor once more? I was just there in Battlefront, and it’s not nearly as charming as it once was. I did enjoy seeing a fresh Lego take on Jedi events, but a cutscene would have done the trick. I mean awwww, but still. Besides, I’ve already played Lego Return of the Jedi. It was part of Lego Star Wars II, which covered the original trilogy. It was the follow-up to 2005's Lego Star Wars, the first Lego movie game, which managed to make the prequel trilogy seem much more entertaining than it was. Both of those games packed massive amounts of movie into a small space, giving fans a whirlwind tour of the Star Wars universe. The tour the story missions of Lego Star Wars: The Force Awakens takes us on is much slower-paced. The tour guide spends great chunks of time explaining each scene in detail, adding their own little flourishes to really give the group their money’s worth. An elderly couple at the front keeps asking questions, holding everything up when all the rest of the group wants to do is see Starkiller base explode and hit the gift shop on the way out. The game takes a two and a quarter hour movie and squeezes 10 chapters and an epilogue out of it. There’s a lot of action packed into the six or so hours it takes to make it to the end—Finn and Rey’s daring escape from Jakku aboard the Millennium Falcon, the First Order invasion of Takodana, caught between two angry space gangs with Han Solo and Chewbacca, to name a few. There are also many not-so-exciting bits laced between those exciting bits. Thrill to the exciting gathering supplies for the Millennium Falcon before the epic battle scene! Shiver as Rey and BB-8 stumble through 15 minutes of puzzles that represent a scene in the movie where Rey walks down some stairs and finds a thing. No one will be seated during the ten minutes it takes getting the door to the fully operational Resistance base open. Gotta make sure we have Wookie Cookies before the final battle. We’re running out of time, but priorities are priorities. I came into Lego Star Wars: The Force Awakens expecting a short story mode. I would have been completely content with four or five hours’ worth of riffing on the stuff that was in the movie. 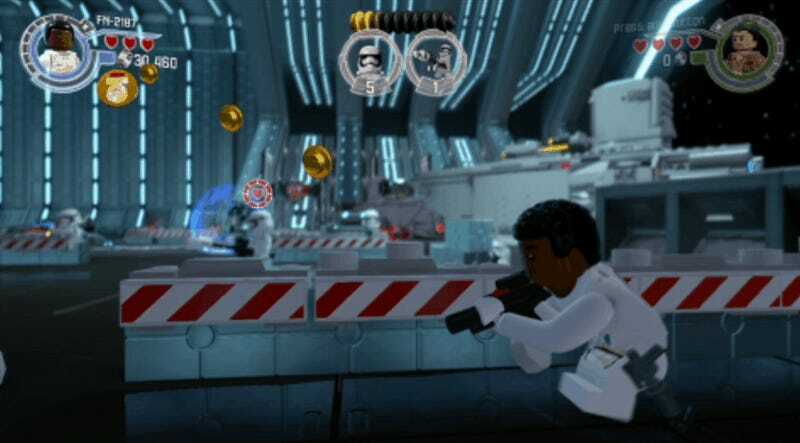 Adding a shootout to Finn and Poe’s escape from the Star Destroyer Finalizer to show off Lego’s new third-person shooting mechanic? It’s pretty fun, why not? Letting Rey and BB-8 explore derelict ships on Jakku before making their way to the fated meeting with Finn? Cool, that’s a place I wouldn’t mind exploring more. The new cover shooting mechanic is a nice break from the standard minifig flailing combat. When the filler is good, I don’t mind at all. When the filler is extraneous nonsense it kills the game’s pacing. I’ve seen the movie. I’d daresay anyone interested in this game has seen the movie, and I doubt many of them want to spend 15 minutes following the big battle briefing fetching ice cream for a recalcitrant Resistance hero so he’ll open the door to a supply cabinet. Lego Star Wars: The Force Awakens doesn’t need that nonsense, especially considering the amount of post-story content TT Games created to keep things going after the credits roll. Players are free to explore Jakku, Takodana, the Resistance Base on D’qar and the Starkiller Base, unlocking new characters and gathering gold bricks through exploring and a plethora of side missions. The most exciting post-game content is a handful of special story missions that expand upon plot points either untouched or merely mentioned in the movie proper. Despite being played out by silly Lego people, these expanded adventures add depth and weight to the characters from the film. Poe Dameron’s daring rescue of Admiral Ackbar from a First Order Star Destroyer further establishes the pilot as a hero of the Resistance. Ottegan Assault, a mission that explains how the First Order knew it had to be at Jakku in time for the movie to open, gives Kylo Ren a chance to demonstrate the full extent of his power while giving the woefully underused Captain Phasma a moment in the sun. I kinda want to ship these two after playing this. What’s amazing is these side stories are all a Lego take on mostly brand-new canon material, voiced by actors from the film. They let Gwendoline Christie say more than three lines! They got Harrison Ford to say “Wookie Cookies!”Max von Sydow’s Lor San Tekka—the older gentleman from the beginning of the film—gets his own boring adventure. They aren’t all winners, but they’re all examples of exactly the sort of fiction-expanding content every licensed video game needs. Beneath hot and cold running filler lies a bed of basic, family-friendly fighting and puzzle-solving gameplay, enhanced by a trio of mechanics new to the Lego series—Blaster Battles, Multi-Builds and space combat. Blaster Battles, the most successful of the three, transforms the game into a cover shooter. Characters duck down behind debris or press themselves against walls, peeking out to take shots at the enemy, dropping back when fire is returned. Blaster Battles are fun in an auto-aiming, loose-y goose-y sort of way. They’re a bit overused—almost every level features at least one Blaster Battle segment—but they’re a welcome break from chaos of the flailing minifigure combat the franchise is known for. Space battles come in two flavors, on-rails and open arena, and they’re fine. Dodging cannon fire through twisting canyons and facing off against an entire squadron of Tie Fighters on your own is initially exciting, but the Lego series’ lack of stakes takes the edge off. You die, you respawn a little lighter in the wallet. It’s the same in every Lego game, but somehow I feel it more acutely in the middle of what should be a tense dogfight. Finally we have Multi-Builds, piles of Lego bricks that can be assembled in multiple ways. Their success really depends upon their implementation. Sometimes they feel tacked on, like when they give the player two different ways to perform the same task. Say there’s a dionaga (tentacle beast) blocking the way through a First Order trash compactor. One build might create a mass over the creature that can be pulled down on its head. Another creates a giant fishing rod, snaring the beast. The outcome is the same; the options are merely cosmetic. Multi-Builds really shine when used in puzzle situations. An energy current slowly moves through a broken circuit. The player uses a set of blocks to create a bridge for the current. The current passes, and the player breaks the bridge, rebuilding it further down the line. That’s the sort of clever implementation that makes Multi-Builds an exciting addition. 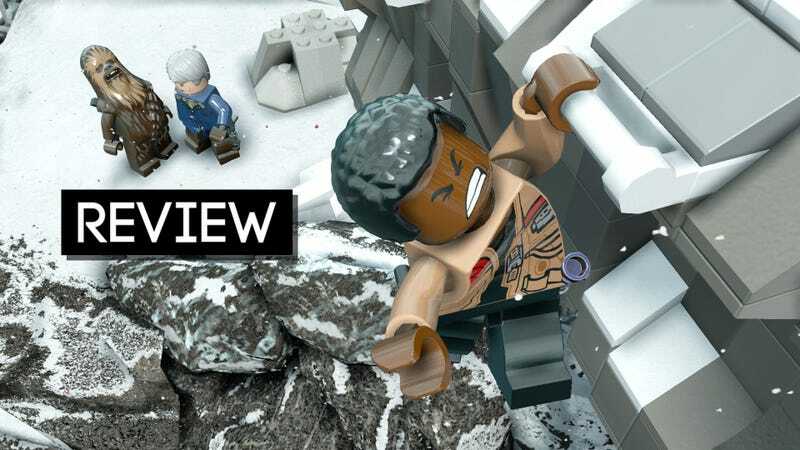 While the three new features don’t exactly revolutionize the series, they’re enough to make The Force Awakens more than just another licensed Lego action game. Considering this is something like the 18th game of its ilk released in the past 11 years, that’s saying something. With all of its filler, both good and bad, Lego Star Wars: The Force Awakens still feels like it should have waited for a few more movies. As I set about scouring the game’s levels for special bricks, mini-kits and other goodies fans of the extended franchise obsess over, I keep thinking about what a great third of a trilogy game this will make once Star Wars Episode IX arrives in 2019.